The BI1brainterface, brainwaves to midi/cv control of musical instruments (and more) is coming. The BI1brainterface is compatible with the Neurosky MindWaveMobile® headset. The following is a quick render of the desktop version. There will be, of course, also the eurorack module! BI1brainterface, brain activity to CV/MIDI interface. The product release will see two different version: the eurorack module and the stand-alone desktop BI1brainterface. 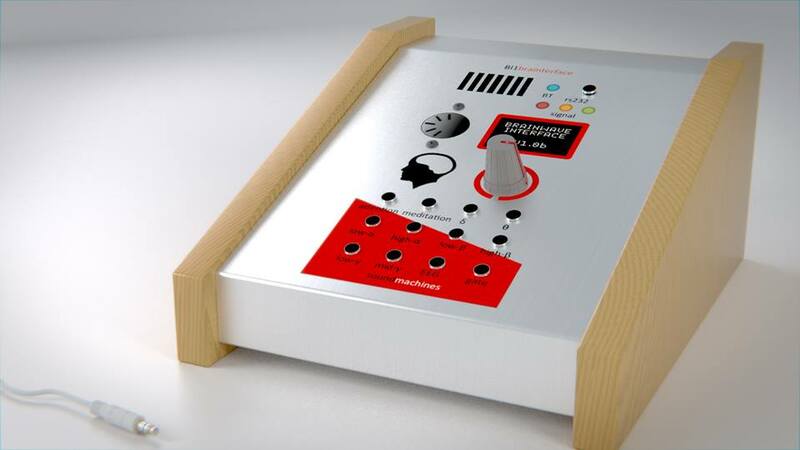 The interface will transmit to your equipment your EEG reading (8-band power spectrum) plus a couple of high level informations like Attention and Meditation. Functionalities are shared 100% between the two and we designed the Desktop Edition to be used by the non-eurorack customers! Both products will have an integrated user interface with a graphic OLED display that allows ther use to configure the machine. Smoothing of the signals, trigger threshold, additional algorithms, scaling, midi channel and cc for each output are completely configurable. We did not forget the tinkerers that, adding to the voltage outputs, will enjoy the availability of an RS232 interface that outputs the values of the EEG readings OR could drive the DACs by sending serial commands. We are testing the protoypes right now and starting the production, due on the second half of september. We are very excited about this new product and there will be many new materials online soon.